Did you hear? The sort of old, sort of new, but much smaller iPhone is coming out tomorrow! Sometimes people are so excited for phones that they line up for them. Should you be one of them? What if I am a HUGE Apple fan? But what if I don’t stand in line and they sell out? What if I don’t have an internet connection at home, so I can’t preorder like a normal human being and have it delivered to my door? 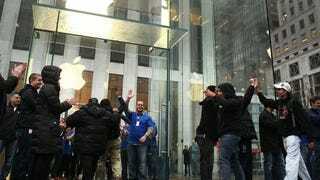 What if I’ve stood in line for every iPhone since the original, and at this point it’s like a tradition? Like, part of how I self-identify? What if someone is paying me to do it for them? What if I just happen to have that day off of work and find myself near an Apple Store and the line is only like eight people deep and I’ve got nothing better to do? What if my standing in an iPhone line was my dying grandmother’s last wish? What if someone straps a bomb to my chest and demands that I go stand in an iPhone line for them, sort of like that movie 30 Minutes or Less and/or the real-life events that inspired that movie? This post originally appeared on Gizmodo in Sept 2013. It’s been updated to reflect this year’s crop of iPhones, and we will keep updating it for as long as people stand in line for iPhones.